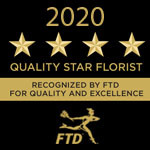 Flowers from Main Street Florist & Gifts Inc in South River will make anyone happy on their birthday, anniversary, graduation, new baby or any occasion. Whether you want to send a fresh flower bouquet of gerbera daisies or roses, you know you'll be sending the best bouquet. Send a mixed bouquet of thank you flowers or beautiful anniversary flowers. You'll find the best right here! Ask us about same day delivery to South River and the surrounding area.